There is so much to look forward to this year at Dorsett Wanchai, Hong Kong - a 4.5-star flagship hotel of Dorsett Hospitality International, with its series of innovative and vibrant hotel offerings echoing the group’s brand promise to ‘Stay Vibrant’, in addition to offering a fine collection of room and theme suites. Topping the list is Dorsett’s very own happy ‘Dorsett Wine Hour’, which is held every Wednesday evening from 6 pm – 7 pm, welcoming all in-house guests to unwind over complimentary drinks and local snacks. Having the group’s global vision in mind, Dorsett Wanchai Hong Kong Hotel has also set up Dorsett Open-Stage in the lobby during this magical hour – supporting young local talent by inviting them to perform on stage on a regular basis..
“If you think you’ve got what it takes to be a star, we welcome you. 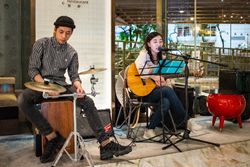 We stay connected with the local community through this special hour by supporting young and aspiring musicians, and by letting them perform like stars and so shine on stage,” said Ms Anita Chan, General Manager of Dorsett Wanchai, Hong Kong. “We have actually been busking for years but this is our very first time to give a performance in a hotel lobby. It is a wonderful opportunity for us to perform in front of local and international travellers, it helps set the path to fulfil our dream. Thank you Dorsett for the invitation – we are so glad to be here!” said Yan, the female vocalist from local band, the WeekendHK. The open-stage is not the only highlight of Dorsett Wine Hour, birthday stars will also be pampered with a special celebration and a chance to draw out a Dorsett Fortune Egg – each comes with a blessing as well as an exclusive perk for the birthday guest. For those who are interested in horse-racing at the neighbouring Happy Valley racecourse, a ‘Happy Wednesday Pack’ consisting of free admission ticket, free drink coupon, and shopping coupon will be given to ensure a fun-filled night there. Even better, interesting art-inspired events like the recent art pop-up store co-organised with the Hong Kong Arts Centre can be spotted if guests join the Wednesday fun in the lobby. To explore more of the hotel, stay tuned at Dorsett Wanchai’s Facebook and Instagram accounts! The award-winning 4.5-star Dorsett Wanchai, Hong Kong is conveniently located between Wanchai and Causeway Bay on Hong Kong Island giving its guests easy access to all business, shopping, and sightseeing destinations in the city. The hotel is a mere 8-minute walk to MTR stations, Times Square, and a 10-minute drive from the Hong Kong Convention and Exhibition Centre. The Dorsett Wanchai, Hong Kong offers 8 types of newly renovated rooms and suites ranging up to 48 sq. m. The signature Grand Deluxe Course View Room offers a breath-taking view of the racecourse in front of the hotel. A complimentary shuttle bus service is available to 14 destinations via five routes and all rooms are equipped with 200Mbps high-speed Wi-Fi internet. Other facilities include the Dining House Restaurant that serves the finest Guangdong and Huaiyang dishes, the 3T Bar, a gym room, and various meeting spaces. Visit: http://www.wanchai.dorsetthotels.com.